After taking Bella and Zipper to the beach, I decided it was time to get something to eat. Mom had been eating crackers, so I took that as a sign she was getting hungry. We had to stop at Wal-Mart for a few things so I wanted to stay in the north end. Since we had the dogs, we had to eat, then go grocery shopping. Trying to do it in reverse would be pointless, the dogs would destroy everything. Cheap Charlie’s had disappointed me the last couple of times so it was time to find another go to when I am home visiting. I am sure I will give them another chance because I love their CC sticks. I knew the last time I was home, they were building a Texas Roadhouse, but my mom didn’t think it was open yet. I decided to drive by to check it out anyway. The number of cars indicated they were open, and appeared to be pretty busy. We pulled in and found a handicapped location right in front of the door. Because my mom walks with a walker, it is always easier when we can get close to the door. After getting the dogs settled, we headed in to try Port Huron’s newest restaurant; Texas Roadhouse. Once in, there was a small amount of people sitting around waiting for a table. I asked how long and was told 5-15 minutes. Not bad, considering the number of people. I sometimes forget about the difference between Port Huron and Kansas City in regards to the number of people! We ended up waiting about 15 minutes, which isn’t bad. We started to be seated in about ten minutes, but they noticed mom had a walker so they asked me if I wanted to wait a few more minutes for a table that would be better for her. She wouldn’t have to walk as far and they thought it would be easier for her to sit at. I truly appreciate when businesses give thought like that to the situation! I thanked them and said we would gladly wait a few more minute. You could tell it was relatively new, everything still had that nice, “polished” look about it. The staff all seemed to be working efficiently. I asked the one seating us when they had opened and she said April 6th. For only being open about a month, they seemed to be doing well. The music was a little loud, even by Texas Roadhouse standards. I have been in a few and I don’t remember it being difficult to talk over the music. I didn’t mind it, but with my mom being older and wearing hearing aids, I was concerned it might be a little too loud for her. They served the warm rolls and cinnamon honey butter right when we sat down. I didn’t even want to wait for a drink because they looked so good. Luckily, I didn’t have to wait long! Rachel, our waitress, appeared right away to take our drink order. I have been trying to drink more water, but I ordered my Coke with lemon that night because I knew I was having steak and a cold Coca Cola with a lemon wedge just goes better with steak! While I was waiting for our drinks, I bit into a roll. It was as good as it looked! 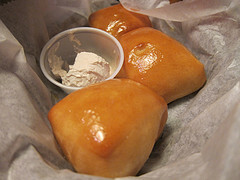 I honestly don’t think I have ever had a bad roll from a Texas Roadhouse though so this location continued the trend. She brought our drinks and as my mom was ordering her food, I took a sip. Ugh!!! It was Diet Coke! I HATE the taste of diet coke. When it was time to place my order, I politely told her I thought, perhaps, she had grabbed diet instead of regular, then proceeded to place my order. She immediately brought me another one, which I took a sip of, and said it seemed better, but then, after taking a couple more sips, I was sure it wasn’t regular Coke, but diet again. She said she had made sure she grabbed it from the regular Coke when she brought it to me. I proceeded to eat my salad, which, was DELICIOUS! Honestly, it was one of the freshest restaurant salads I have had in a long time. There was just enough of everything, the dressing, blue cheese, had a nice flavor to it. I was impressed. If only the drink situation could be resolved! Rachel came back and I asked her what other beverages they had, I just couldn’t drink this Coke anymore. It wasn’t right. She told me, but none of them sounded appealing. I know it sounds silly, but for me, a bad beverage can really make a difference. I was about to switch to water with lemon, because I knew it would taste OK, when she offered to go and get me a Coke from a different unit. Honestly, at that moment, I so appreciated her! She could have just brought me water with lemon and thought I was some crazy restaurant goer, but she went above and beyond to try to resolve the problem. She brought me the new drink and I took a sip…… HALLELUJAH….we have regular Coke! It was delicious too! I’m sure I had a happy smile on my face, because she said she was going to look into it. I didn’t expect anything more from it because they were busy and again, I figured she chalked me up to just a crazy person, I know I probably would! Our meals came and I was impressed by the way they looked. 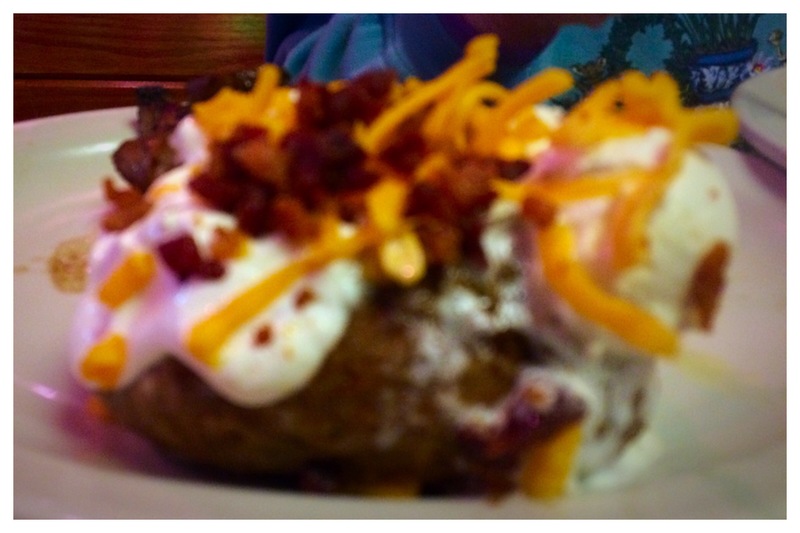 Starting with my mom’s meal, she had ordered a loaded baked potato. The potato was, indeed, loaded, but more than that, you could tell how warm it was because the butter was melting down the side of it! It made me almost regret getting steak fries it looked so good! My steak and fries looked perfect. I had ordered mine medium rare, which can be a crap-shoot at some restaurants, so I was hoping I would not be disappointed today. So far, other than the beverage, the food was spot on. I ordered the bone in ribeye. As you can see, it came out looking wonderful! 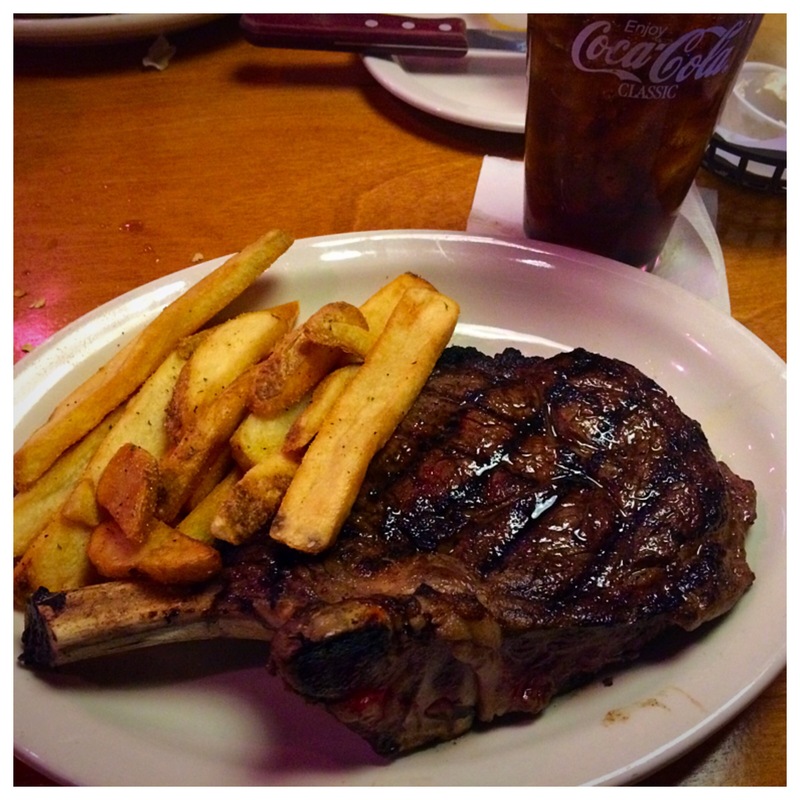 Bone-in Ribeye, Steak Fries, and a Coca-Cola, a winning combination! The first thing I noticed was how well it cut. It sliced through so easily I almost thought I missed the steak at first! It was prepared perfectly. The medium rare was visible, not too rare (which usually happens). I bit into it and it was so full of flavor as well! Perfect temperature, just enough flavor. i was happy. I would like to rave about the steak fries as well, but they were, well, just steak fries. They weren’t bad, they were good, but compared to the steak and the look of my mom’s baked potato, I have to say, they were just good. Funny story to go along with the meal, Rachel came back after serving the steaks to tell me a manager had gone to check the fountain and discovered someone had accidentally hooked up the Diet Coke syrup to the Coke! I had been redeemed! I was not just a crazy person! The manager was with her when they told me and we all laughed about it. Mistakes happen, I’m just glad they followed through and actually checked it rather than just letting it go. I wonder how many others were given the wrong drink and just didn’t say anything about it? My mom said hers was really good as well. She didn’t finish her whole steak and there was a roll left over, so we took it home and I made her a steak and cheese slider with the roll the next day for lunch. She was pretty happy with it! Overall, a very nice experience. There have been times in the past when Port Huron would get a restaurant and the quality or service wouldn’t be what you had come to expect from other locations, so I was pleased to see this Texas Roadhouse not only MET my expectations, but, honestly, superseded them! Something you don’t expect with a chain restaurant. I would highly recommend stopping in there if you live there or if you’re passing through on your way to Canada or just in the area. This entry was posted in My Day to Day Craziness, Product / Company Reviews and tagged ADA Friendly, Bone-in Ribeye, Canada, Coca-Cola, Coke, Diet Coke, Fort Gration, Loaded Baked Potato, Michigan, Passing through, Port Huron, Restaurant, Restaurant Review, Texas Roadhouse.